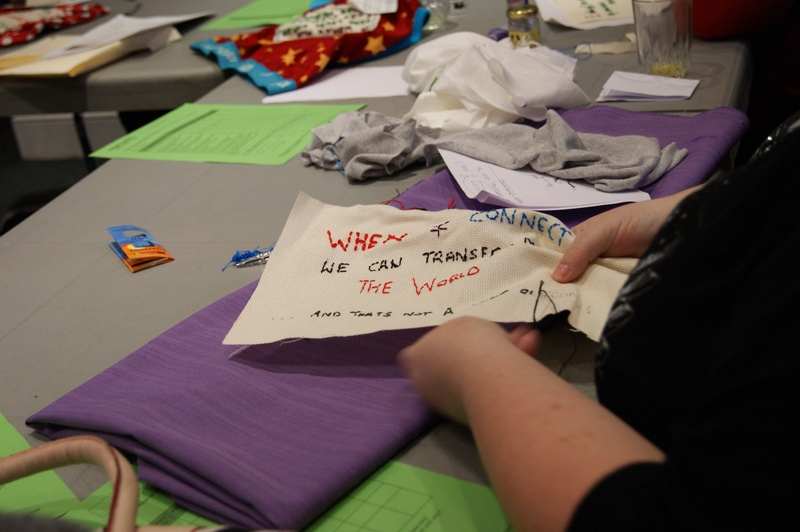 Written by craftivist Lorna McBride: In the run up to International Women’s Day Manchester campaigners celebrated the value of women’s work in society, by making a colourful public washing line to hang in Manchester city centre. 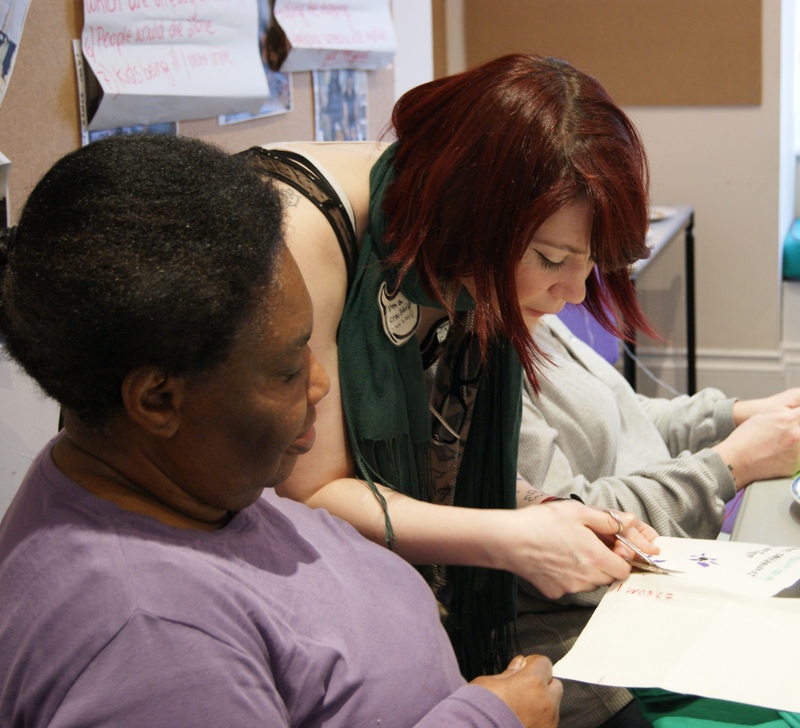 Dozens of women from The Pankhurst Centre and Women Asylum Seekers Together (WAST) came together to take part in Craftivist workshops, organized by Oxfam’s UK Poverty Program and facilitated by the Craftivist Collective’s Sarah Corbett. The women wanted to make a statement about the importance of the work women do in their daily lives, which is often forgotten by society. In the workshops they discussed how much women do in society that is not necessarily recognized as paid work, but without which society would not be able to function. The women involved were passionate about getting these sorts of work recognized and appreciated by society. Through cross stitch, embroidery and fabric painting, the women created their messages on patches of fabric and then sewed them onto items of clothing which they had brought in. 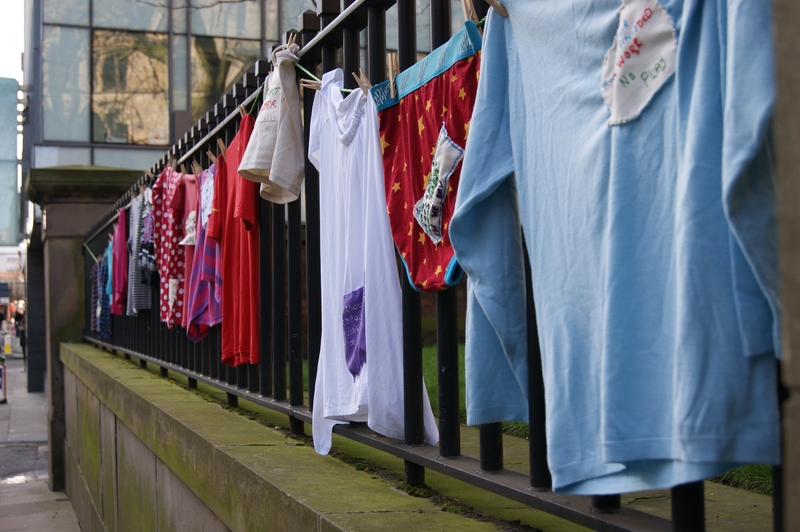 Joined together, the washing line of clothes illustrated the fact that each and every day women do huge amounts of unpaid work across the globe: things like looking after children, housework, shopping for family and neighbours and visiting relatives in hospital. It is estimated that women do twice the number of hours as men on household tasks including washing, cooking and food shopping. The vibrant messages were then hung along the railings of the Friends Meetings House in Manchester city centre, encouraging members of the public to stop and read them – a means of drawing attention to the issue in an alternative and creative way. Also in attendance at the Friends Meeting House was Kate Green, MP for Stretford and Urmston and shadow Minister of State for Equalities. Always enthusiastic about supporting women’s causes, said she was “delighted to celebrate the hidden contribution of women’s work that makes the world go round”. The aim of the project was to create a positive and interesting talking point for passersby to be able to come up and read the women’s messages, to understand why the hard work of women is worth celebrating. As an added bonus, all of the women who took part in the workshops commented on how enjoyable and therapeutic the process of creating their pieces was and were asking us when the next workshop would be! Love this story! I’m in town tomorrow – will the washing still be there? Love this story! I’m in town tomorrow – will the washing line still be there?